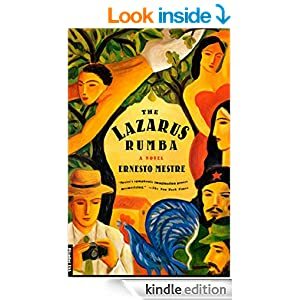 I finally finished The Lazarus Rumba by Ernesto Mestre! I started reading in August. It was a slow read for a long time. I would pick it up, then put it down and pick it up several days later, which sometimes turned into weeks. Finally, a couple of weeks ago I decided that I needed to finish it; there were too many other books waiting to be read. I didn’t dislike the book enough to abandon it but I was having a hard time getting through a chunk at a time; it seemed like I was reading two or three pages a sitting for way too long. So, during this previously unplanned February break from school, I was determined to finish it. And, as it turned out, once I started reading in earnest, I couldn’t put it down. Once again I proved my own theory, and one that I often share with my students: if you don’t read a chunk of a book at a time you can’t know if you really like it or not, and you will not understand, or remember, enough of what’s going on to want to keep reading. Although I did not appreciate the thread of political conservatism that winds throughout this book, I loved the magical realism side of it. And, as usually happens with books of this type, I wondered what parts of the story were real, and what parts were magical? Or, maybe the important take away is that the entire book is a statement about life as a magical journey that is over all too soon. In the end, whether or not the events in the book are real is irrelevant since it’s always about the story and what the reader can learn about his/her own life, as a result. Despite some misgivings about Mestre’s political stance in the book, I am planning on reading his second book, The Second Death of Única Aveyano. From the summary of this book on Amazon, it may not take me as long to read it as it did to read The Lazarus Rumba. Keeping my fingers crossed.